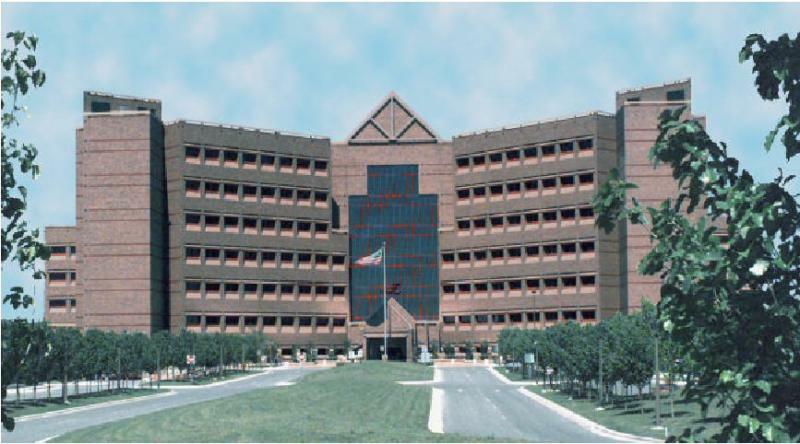 BAMC Auxiliary - MISSION STATEMENTTo support the patients of Brooke Army Medical Center and the military community through service projects, fundraising, and special events. To support the patients of Brooke Army Medical Center and the military community through service projects, fundraising, and special events. Active membership is open to any adult, age eighteen or older, with military or DOD affiliation, including active duty, dependents, and retirees connected to Joint Base San Antonio (JBSA). WANT TO KNOW MORE ABOUT OUR UPCOMING EVENTS? Check out our Facebook Page or email our Membership Chair. The BAMC Auxiliary was founded in 1953 as a military spouses’ organization. We hold monthly events and service projects that encourage friendship and support among military families. 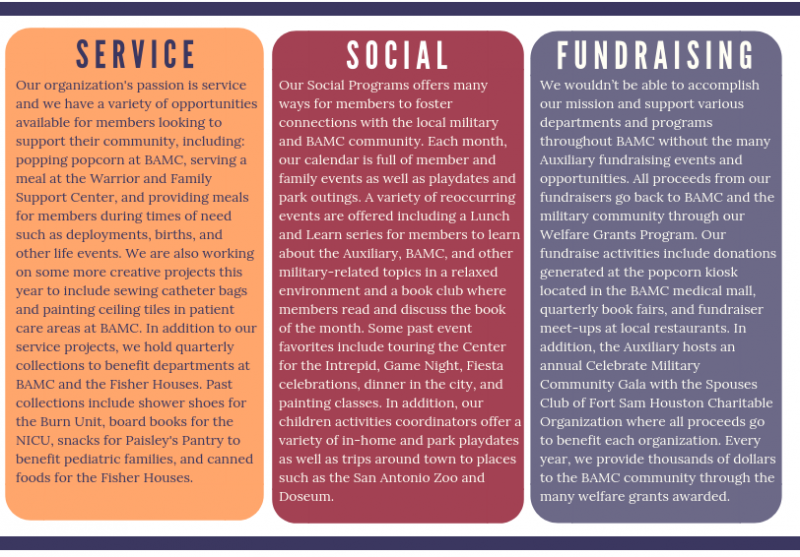 We fundraise for and support various BAMC and Fort Sam Houston organizations including the BAMC Army Fisher Houses, the Warrior and Family Support Center (WFSC), the Center for the Intrepid, and various hospital departments and services within BAMC. 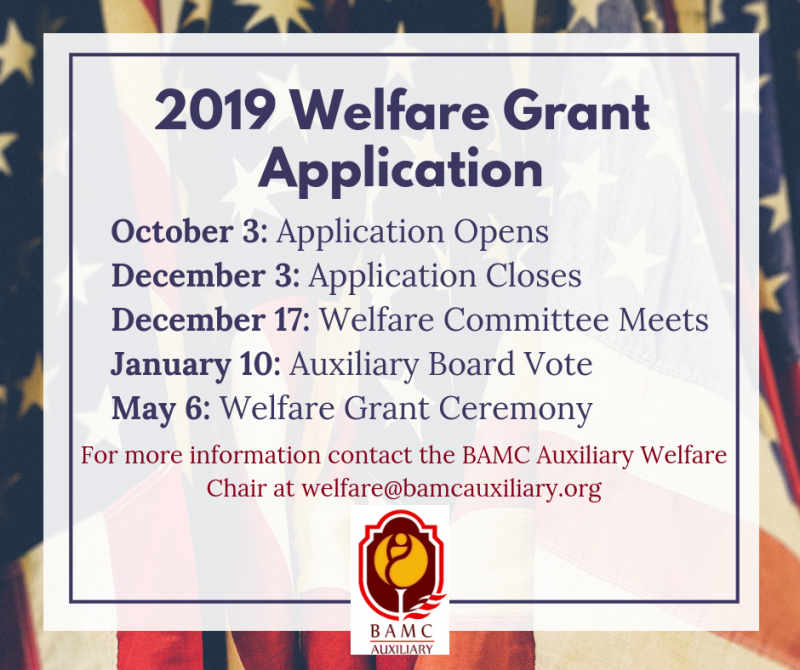 To download the application, please visit our Welfare Grants page.